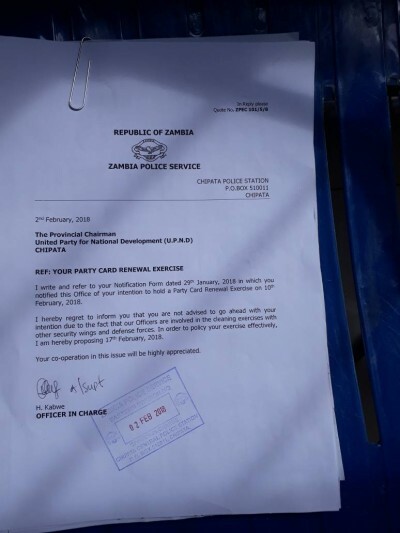 The police in Eastern Province has blocked the opposition United Party for National Development (UPND) card renewal exercise which was scheduled for 10th February 2018 on the pretext that police officers are busy ‘sweeping cholera’ off the streets. ‘I hereby regret to inform you that you are not advised to go ahead with your intention due to the fact that our officers are involved in the cleaning exercises with other security wings and defence forces,’ reads part of the letter signed by Chipata Central Police Officer In Charge, H. Kabwe. The police have instead proposed 17th February 2018 as an alternative date, that is if they would have finished ‘sweeping’ the streets of Chipata.